April 27th: Galveston Island Wine Festival Champagne 5K – Lace up your kicks and raise your little finger, it’s time to toast the 3rd Annual Galveston Island Wine Festival Champagne Fun Run! This morning race takes you along the beautiful scenery of Galveston Island. Starting & Finishing at Beerfoot Brewery on Galveston’s quaint island seawall, this 5K Fun Run will feature an easy route with a celebratory champagne drink at the finish line. To register go to eventbrite.com. April 28th: Divas Half Marathon & 5K – This scenic course will begin and finish at Moody Gardens. Runners will experience Seawall’s long beaches historic piers and some angry waves hitting the rocks just beneath the beach-walk! Runners also go through a beautiful residential community with amazing architecture. Finally, Schlitterbahn Park is visible within the last two miles, where runners will see the adventurous and thrilling attractions! Along the way, runners will enjoy our “Diva stations,” including the famous Boa and Tiara station. You will end your Diva run with the most impressive medal ever and a beautiful view of the best of Galveston, bubbly toast and many other Diva touches. A truly memorable experience awaits. Register at runlikeadiva.com. May 4th: Galveston Island Brewing Co. 5K Beer Run – Come out for this fun event benefiting Galveston Island Humane Society. This is event #3 in the Run in Texas 5K 6-Pack Series. It is walker friendly and starts and finishes at Galveston Island Brewing Company. Run a well supported, well-staffed 5K on a fast and flat course on the Seawall beside the Gulf of Mexico. There will be a post-race party with food trucks, and four 8-ounce beer tastings in finisher glass are included. All runners will receive a finisher pint glass and tech shirt. To register go to runintexas.com. Early registration is until April 4th. Please direct all questions to info@runintexas.com. May 11th (8am): 10th Annual Run Wild 5K – Run WILD with the Yagas Childrens Fund Inc. along the Galveston Seawall! This family-friendly walk/run is a non-competitive event for Wild Things of all ages before they head down to Pier 21 for some delicious Wild Game and free-flowing beverages. Your entry fee includes a t-shirt, souvenir event koozie, and two free libations (one at packet pick up and one at the event). Not only is this a great deal, by participating you will help support the moral, psychological, intellectual, vocational, and physical development of Galveston County’s children. This race begins at Beerfoot Brewery, 2816 Ave N 1/2. Register at eventbrite.com. August 17th: Galveston Sand Crab 5K, 10K, and Kid’s Beach Mile – Start and finish at East Beach in Apffel Park. Run entirely on sand, the Sand Crab is a great way to get a little exercise under the stars on a beautiful Galveston Beach at night, and have a few beers and other refreshments while listening to great music with other runners on a summer night. All races are chip timed including the Kid’s Mile. The Kid’s Mile will start at 8pm. Parents are welcome to run with kids free of charge. The 5K/10K will start at 8:30pm. The 5K run is very walker friendly with a two hour cut off. The 10K is walkable but will share the two hour cut off. 10K runners must be at the 3.1 mile turnaround within one hour. Registration prices are $20-$65. 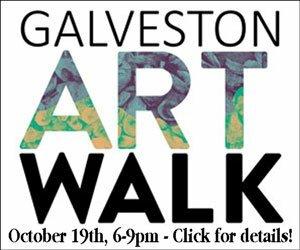 This event benefits The Galveston Island Humane Society. For more info and to register go to runintexas.com/gcrab. September: The Daily News Press Run – Run, walk, or jog in Galveston’s premier Causeway Run. The Daily News Press Run supports the Newspapers In Education program. Featuring certified 5K and 10K courses, an exciting Kid’s 1K, vendor booths, food, drinks, snacks, moonwalks, music, a costume contest, and much more, this race is fun for everyone! For more info go to dailynewspressrun.com. September 8th: Captain Kids Triathlon – In its 4th year, Captain Kids Tri is a triathlon just for kids. There are two divisions: Mates (USAT age 11-14) and Mini Mates (USAT ages 6-10) with different course distances. This race is $65 and is limited to 600 participants. For more info and to register go to captainkidstri.com. September: Island Girl Tri – Island Girl Tri is a super fun multi-sport event! This race is perfect for those who want to do their first triathlon and for veteran triathletes as well. Enjoy a 200 yard swim in the Palm Beach lazy river at Moody Gardens, a flat 8 mile bike ride in Galveston, and a 2 mile run around the lush and tropical Moody Gardens. Stick around for post-race fun, food, and refreshments. We welcome women and girls, ages 8 years old and up. For more info go to islandgirltri.com. September: 5k Shrimp Scamper – Enjoy the official 5k of the Galveston Island Shrimp Festival. 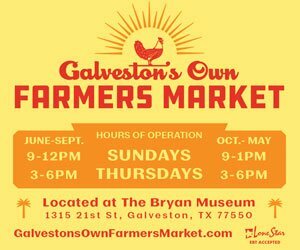 This is your opportunity to scamper your way around Galveston’s beautifully rebuilt beach and follow it up with a day of great eats and drinks. 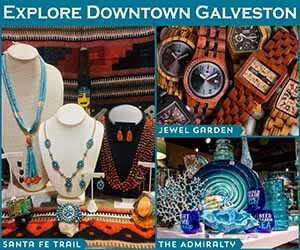 For more info about the Galveston Island Shrimp Festival go to galvestonislandshrimpfestival.com. October 12th: Galveston Walk to End Alzheimer’s – Held annually in more than 600 communities nationwide, the Alzheimer’s Association Walk to End Alzheimer’s® is the world’s largest event to raise awareness and funds for Alzheimer’s care, support, and research. This inspiring event calls on participants of all ages and abilities to reclaim the future for millions. The walk will take place 8am-12 noon at Stewart Beach Park, 201 Seawall Blvd. For more info and to register go to act.alz.org. October 19th: The Toughest 10K Galveston – This run is part of The Texas Bridge Series. Run the Kemah Bridge in September, the Galveston Causeway in October, and the Fred Hartman Bridge in November to get a commemorative special medal. The race will start at 7:30am and will be chip timed. For more info and to register to go toughest10kgalveston.org.